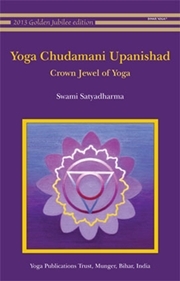 Yoga Chudamani Upanishad is a manual of higher sadhana for advanced and initiated aspirants. It delineates the ancient path of kundalini awakening in its original and pure form before the proliferation of modern yogic literature. The text elucidates a unique combination of kundalini yoga and vedantic upasana. It discusses the nadis, prana vayus, chakras and kundalini shakti, and also provides detailed descriptions of ajapa gayatri and pranava, which are older vedic and upanishadic meditative disciplines. The text includes the original Sanskrit verses, along with transliteration, anvay, translation and a comprehensive commentary by Swami Satyadharma Saraswati under the guidance of Swami Niranjanananda Saraswati. For students of Indian philosophy, it provides a valuable study of the compatibility of Yoga and Vedanta, or the tantric and vedic systems of philosophy and practice.